This mechanical combination lock has been developed and manufactured by Asec, they maintain steady business in the security industry and focus their attention on the needs of our customers. 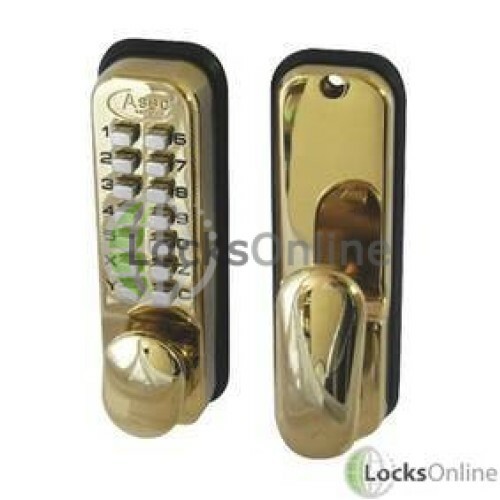 The Asec AS2301 brass mechanical combination lock is suitable for internal usage and **does not** require batteries,This model is capable of 8,191 possible combinations with code lengths that can range between 4 and 7 digits, giving excellent security on an internal home or office door. 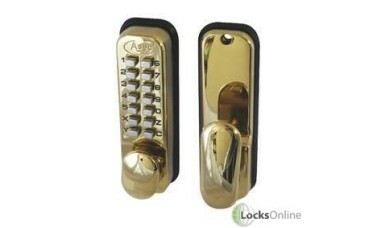 The items supplied with this product include Keypad with handle, backplate with handle, 2x protective backplate covers, 60mm standard Latch, tweezers (Which are used to change the code, a full review on this can be found in our video reviews, a summary is below) This model comes in a brass finish. 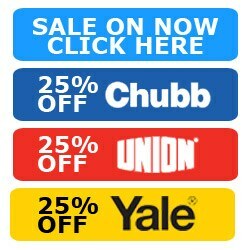 Perfect for internal home or office use. Operation of the Asec AS2301 is achieved from the outside using the keypad and turn of the knob. 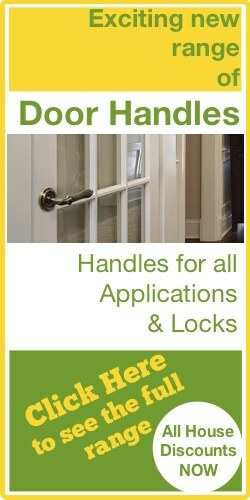 Inside operation grants free access with a larger paddle style handle design which allows quick and convenient egress. 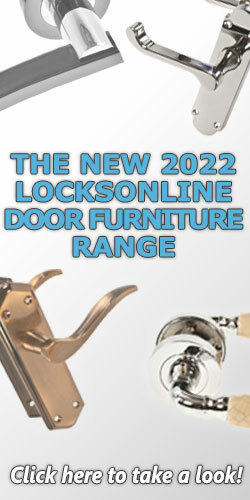 We do not recommend that the Asec AS2301 is to be used on external front or back doors, although models for that application are available at LocksOnline. This model has an optional snib function that allows free access until the snib is turned back to this off position again. To change the code of this model you will need to remove the backplate of the keypad. All codes begin with "C", This is because this button clears the mechanism of previously entered codes and is therefore essential when entering a correct one. You will see holes on the back of the keypad that have small pieces of metal that are coloured red and blue. Blue denotes code numbers and with the tweezers provided simply move the red pieces into the numbers (Which are marked onto the back of the keypad) to which the ones you would like to change the code to, placing the remaining blue ones in the gaps left. Hi, guys. My name's Darrel. I'm head of the tech team here at LocksOnline, and thanks for taking the time to tune into one of our product review videos. The product that we're going to have a look at today is the Asec Combination Lock that's designed for wooden doors, mostly, but can be fitted on composite doors, etc. So without further ado, let's get it out of the box and let's look at the parts that are actually supplied in the box and what we'll do is we'll go through what the parts do, how they fit, and at the end is where we'll also look at how to change the code. I'll go through the procedures on what you need to know and how exactly do you need to change the code, and what you need to look out for as well. So, let's get it out, let's have a look. So here's the actual front part of the combination lock, and as you can see here, we've got numbers from 1-0, and then we've got X, Y, C. Now, when you get these combination locks, there's a few important things that you need to be aware of, is that the C is always the start of a code, and the reason for that is that the C is what is used to clear a code. So let's assume that your number is, say, 1234, you put in 1234, but if somebody's put in 5678, and then you come and try and put 1234 in, you're not going to be able to open the door, because as far as the combination lock is concerned, the number is 56781234, which is wrong. So what you need to do is you need to press the C key, which then clears the combination and then you would then put your number in. So, top tip, always, if you're going to mention the code to somebody else, always say to them "C", whatever your code is, therefore. On the back here is the actual combination chamber. You've got the spindle that will sit in there, and here's the actual chamber here, and I don't know if you can actually zoom in there enough, Lee, but there's different colours. There's red little icons in there, I've got a few here and I'll show you a little bit later on, but there's red ones and there's blue ones. And the difference between the red ones and the blue ones is that the blue are the non-code pins and the red is the code pins. So the red ones denote the code, and the blue ones don't. And to be able to gain access into there, you'd undo that screw there, you'd undo that screw there, you'd press and hold down the C key, and then by pressing the numbers of the pins that you want to change, you'd push that out, you can then grab hold of those and swap them around until you find the code that you particularly want. So that's how to change the code, it's quite straightforward, but I'll show you what the pins look like and there's a little top tip as well that I'm going show you a little later on. So, it comes with user's instructions, usual instructions, it even comes as well with a template as well, so you just stick that onto door, cello-tape on your door, and then you know where to drill all your holes, etc. So, you know, that's what it comes with as well. It comes with these two little weather shields as well. These sit on the back of the actual, the actual combination lock, and it finishes it off, and obviously it helps to stop the weather from getting in behind the combination chamber. So there's two reasons. If you're doing an interior, you don't necessarily need to fit these, but I think it's more up to you and whether or not you like the aesthetics of it, really. And of course there's one there for the front and there's one here for the back. Now, this is the back of the actual combination lock and this particular one has a hold-back facility, and here you'll see there is a little switch that you can slide left and right, and that will actually hold back the latch, so therefore then the door then will become free access. So if you've got a lot of people coming back and forth, then this then will allow you to go in an out without having to use the code. And one thing about the Asec lock that you've got to bear in mind is, this particular one here is more for low-duty, domestic use. I wouldn't necessarily put this on a door that's going to have a high lot of volume and a lot of traffic through the day. I don't think it's man enough for that sort of commercial application. But store-room, or occasional office, etc., or somewhere at home, I wouldn't see any problems at all. So there you go, that's the situation in regards to the backing plate there. I'll give you those fixing centres while I'm here, because that might be important if you're thinking of replacing, you've got one there, and you're want to know if the footprint is exactly the same. And I will say, guys, that the footprints are virtually all the same, no matter which manufacturer you decide to go for. But that, there you are, the distance from that fixing centre to that fixing centre, that's 130mm, yep, bang-on. And I'll just show you, that's bang-on there. So, that's the backing plate. Now, what we have here as well is the tubular latch. And I just want to show you a little few different things about this now. The backset now, the distance from the faceplate to where the lock is going to actually sit on the door, and that backset distance from there to the centre of the cam there is 60 millimetres. There's a bit of an industry standard in regards to that backset so, again, no matter which manufacturer that you may have, or you want to replace, or you want to fit, you've got to make sure there's enough meat on that door in order to get that backset in. Also, on the front as well here you'll notice that there's a little tongue that sits on the back of the latch as well — I don't know if you can zoom in on that for us, Lee — and that there is called a dead-locking tongue, and the keep, when you put the keep on to the door, the idea is that keep will push that in and in doing so, it'll dead lock this latch here, to stop anybody from using the, you know, if you've heard the credit card, where they can slip through the credit card and open the lock. But that stops that from happening, that's a dead-locking facility there, which is quite important that when you fit the keep, that you fit it so that is activated. Also in the box then as well is that you've got your fixings, and you've got your cam plate there, and you've also got the tweezers, which helps you to take out the pins when you want to change the code, a little tweezers there. But here's the actual pins here, which I'll show you now. Now, I don't know if we can actually zoom in close enough for those, but you will see that there's a square that sits there on both the blue and the red pins. The red denote the code, the blue denote a no-code. Now, it's important, guys, when you're changing the code and you're getting all these pins out, etc., when you go to put them back in, these squares both there and on that one there, has to point outside, to the outside of the lock. So if I'm sitting here and I'm putting the code in here, and I'm wanting to put this particular pin back in, that square would sit to the outside of this side, and if you were fitting it on the other side, you'd need to turn it around and you'd need to fit it then on the outside if it's on that side. 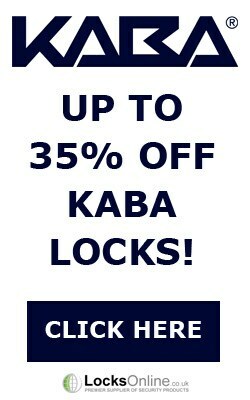 So that's important, otherwise your combination lock isn't going to work, and everything gets frustrated and so forth. So that's important that you make sure that those squares on those pins sit to the outside. So from that, it also comes of course with a code that is preset in the combination lock. Obviously, security tip, change it as soon as you get it. Yeah, it comes with a side of fixings, it comes with three screws, and of course you only need two but it comes with a spare, which is great, and these little knurls here allow you to chop off any size, depending on how thick your door is. So that there would depend on the depth. And then you've got a spare one just in case you bugger it up a little bit, so to speak. And finally, of course, you've got your cam there as well. So there you go, Asec, used for medium duty, I wouldn't necessarily go heavy duty with it, it's not really man enough for a heavy duty application. But for light domestic use or for light commercial use, I don't see there being a problem with this particular product at all. I hope very much that that gives you a little bit more detailed information in regards to the Asec combination lock, but if you need any more information, or if there's something that I just haven't mentioned and you think, "I need to know that," listen, pop us over an email, use our live chat on our website, pop us over an email, we'd love to hear from you. And more importantly, we'd love to see you as a customer, that would be really great for us. So from me, Darrel, at the LocksOnline team here, may I take this opportunity to thank you, and come back and visit us real soon, or come back and watch one of my videos, if you don't fall asleep. All right, take care.